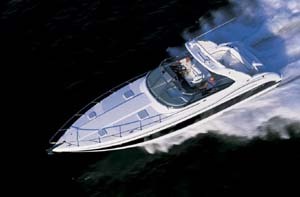 2004 Hustler 50 Performance Yacht, Marine Connection: South Florida's #1 Boat Dealer! New Cobia, Sportsman, Blackfin, Hurricane, Pathfinder, Maverick, Hewes, Sanpan & Sweetwater boats. 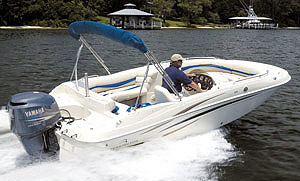 Plus the largest selection of pre-owned boats. View full details and 116 photos of this boat on our website at: http://www.marineconnection.com/sales/inventory/boat/331-2004-Hustler-50+Performance+Yacht Hustler's first boat with multiple steps, the 50 has set the standard for stepped bottoms since hull one. Awesome performance potential coupled with luxurious amenities put the 50 in a class by itself. Cockpit upholstery developed specifically for the 50 Performance Yacht hugs you securely at any speed. The padded hatch, molded swim deck and concealed ladder make the seas your own private swimming hole. Handles in all the right places allow you to move freely when you need to and stay put when you want to. Plush leather couches that hide storage compartments behind them, flat screen televisions, Corian counters, mood lighting, the list goes on. Hardly the list of amenities you'll find in the typical speedboat. Your day trip or weekend away is perfectly comfortable in the Hustler 50. Headroom of 6' in the cabin allows for a true standup head and shower, larger than you would think possible. From stock power though custom race power the same rigging is used, preventing unwanted surprises at sea. Control and helm layout is a lesson in priorities, providing a clear picture of the state of the engines without distracting you from the task at hand … going fast. Vacuum bagging, Kevlar, carbon fiber and foam cores aren't just flashing marketing terms for Hustler … every boat is built by hand one layer of glass at a time. Our skilled workforce consistently builds bulletproof boats, day in and day out. Running comfortably when other boats are struggling is the hallmark of a Hustler hull. Arriving at the dock in a 50 Hustler is a unique experience. 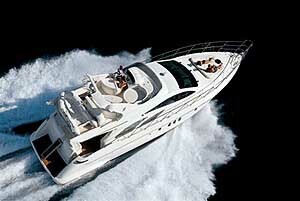 Produced by hand for the most discriminating boaters, the 50 Performance Yacht is without peer. This boat was the 2004 Miami Boat Show Hustler 50. It appeared in the company catalog as well as many magazines. 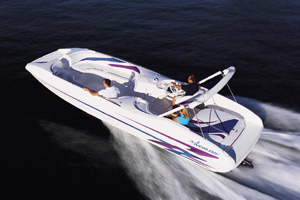 This is a true performance boat with yacht like amenities. This is the best riding rough water boat we have ever seen. 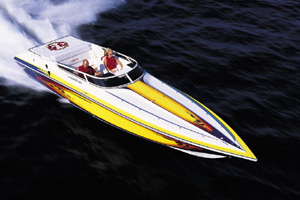 It was originally built for Triple 500 EFI's and in 2010 we did the 525 EFI conversion with three Fresh Water 525 EFI Motors and Brand New Bravo 1 XR Drives. The motors have 170 Hrs on them and the hull has only 200 hours on it since new. This boat has simply every option from underwater LED lights to Reverso Oil Change System to Ultra Leather Cabin Upholstery. This boat costs 600K to build new. Boat comes with a custom MYCO trailer. 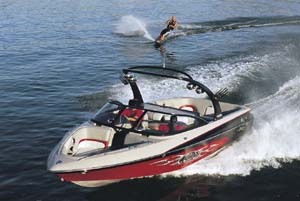 This is the actual boat that was used in 2004 Hustler Catalog. The forward V-Berth has its on TV and vanity with storage. It has a Cedar Wood storage compartment for clothing. The custom MYCO Trailer is included! (costed over $20,000 new) This Hustler is sold as-is, where-is.